I had more than a good turkey dinner to be grateful for this Thanksgiving: Just a couple of days before the holiday weekend, Sprint finally delivered a spanking new PalmOne Treo 650 for our evaluation. I'd been lusting for the Treo 650 since PalmOne executives gave us an in-house demo in late September, so much so that I was beginning to fear that I had been imagining how neat it was. But after spending a few days with the evaluation unit, I'm happy to report that it is as nice an upgrade as I remembered--as it should be, for the $600 it costs (before whatever rebates you can coax out of your carrier). For those of you who didn't catch the initial PalmOne announcement, the Treo 650 is basically an evolutionary revision of the highly popular Treo 600. At a cursory glance, you wouldn't think much had changed--and that's a good thing, because there was no reason to fool around with the Treo 600's basic design, a very successful balancing of the sometimes conflicting requirements of a PDA and a cell phone. The most immediately noticeable improvement is the display. The Treo 650 boasts a brilliant 320-by-320 screen, compared to the old-style 160-by-160 resolution of the earlier model. When I reviewed the Treo 600, I rationalized this shortcoming by noting that since the screen itself is considerably smaller than that of a conventional Palm device, the lower resolution wasn't a big deal. And in the year or so that I lived with the 600, its screen never bothered me. But having spent time with the Treo 650's new and improved screen, I can't imagine going back. It's somewhat akin to the way watching high-definition TV spoils you for old-fashioned standard-def programs. And while you're most likely to appreciate the improvement if you frequently use your Treo to play games or view photos, you'll notice it even if you're simply looking up a contact or a datebook appointment. The new model's keys have small raised edges, so it's a lot easier to maintain a grip on them. As with the Treo 600's display, I didn't really mind the shortcomings of the keyboard; it was adequate for the small amount of typing I do on my handheld. Now that I have something better, though, I wouldn't want to go back. Certainly anybody who's serious about managing e-mail on a handheld will appreciate this improvement. The last of the major upgrades is the battery: The Treo 650 sports a removable rechargeable battery, which means you can charge and carry a spare. Now, the older model's rechargeable battery is no slouch--many a time it lasted an entire weekend for me--but being able to take a spare along is a big plus when you plan a couple of days of intensive use before you can recharge. Since both models are a bit short on memory to begin with, this is a problem. (You get a grand total of 32MB, of which only 23MB is available for apps and data on the Treo 650, less than the 24MB on the 600.) To compensate, PalmOne is offering a free 128MB Secure Digital memory card to Treo 650 purchasers. In a perfect world, the Treo 650 would have Wi-Fi. Sprint's PCS Vision (CDMA 2000 1xRTT) network just doesn't cut it for data speed in a broadband world. Right now, Sprint has an exclusive on the Treo 650; if you're activating a new plan or are an existing Sprint customer who hasn't purchased and activated a new phone in 18 months, you're eligible for rebates that can lower the price to $450. Oddly enough, Sprint hasn't lowered the price of the Treo 600, at least not on its Web site, where it still goes for $600; you do get a small break if you're eligible for rebates, but they just lower the price to $420. The GSM/GPRS version of the Treo 650 will at least have broadband support in the form of compatibility with EDGE, the next step on the GSM/GPRS data roadmap. This will make for speedier e-mail downloads and Web browsing on GSM/GPRS carriers that have implemented EDGE, such as AT&T/Cingular. But there's been no word yet on which GSM/GPRS carriers will be the first to offer the Treo 650. Speaking of successors that are arriving in time for the holidays, I snagged a copy of Astraware's Bejeweled 2 for the Palm OS. I can report that it's an eminently suitable gift for any fan of the hugely popular original. This game involves swapping positions of two adjacent gems in a grid to produce three or more of the same gem in a row, which then disappear. You play until you run out of moves that will produce a three-plus string of identical gems. The most notable change in the sequel is that when you create a string of four gems, they are replaced by a single flashing gem that scores big when it's eliminated in a subsequent string. And if you're lucky enough to create a string of five identical gems, they are replaced by a swirling gem that, when swapped with another gem, deletes all instances of the swapped gem in the grid. This is a good thing since it invariably makes creating strings of the remaining gem types easier. I found these four- and five-string changes to be the most interesting of the lot. Other changes include some music (yawn--I always turn that stuff off), fancy updated graphics (but frankly I don't find them dramatically superior to the originals), and a couple of additional game modes, including one that incorporates elements of Bubble Pop (you have to try to clear the screen of gems). I read on Astraware's Web site that if you play long and well enough, you get to some additional game modes, but I haven't gotten there yet. 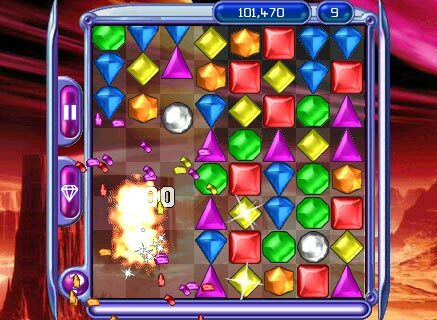 Anyway, as mindless pastimes go, Bejeweled 2 is as good as any--and at $20, it won't break the bank. Diehard aficionados can find versions for the Palm OS, Pocket PC, and Microsoft Windows at Astraware's Web site. You can also play a limited version of Bejeweled 2 online for free at PopCap.com. Got a question about handheld computing? Write to The PDA Pundit.